As minorities in America step into fulfilling successful roles in society, we begin to see a new face of what America represents. Minorities have emerged as successful entrepreneurs, politicians and leaders in American society. In the August 2013 issue of The Atlantic, Jordan Weissmann sets forth an argument that entrepreneurship is the ultimate white privilege. His reasoning is based on recent studies showing that entrepreneurs have certain common characteristics, including a tendency toward breaking society’s rules. Given that people who are white and affluent can break rules with fewer consequences than others, Weissmann concludes that entrepreneurship fits squarely in the domain of white privilege. While it’s an interesting argument, it has little to say about how the entrepreneurial drive of minorities, immigrants and people of color created some of the world’s most innovative, creative and game-changing companies. Google, Yahoo and YouTube can claim founders with immigrant roots. If an implication of Weissmann’s argument is that non-white entrepreneurs have to work harder than white entrepreneurs to succeed given their inherent disadvantage, this is probably not news to anyone. In our issue on entrepreneurship, Saad Ansari explains how minorities come with a unique set of networks and range of economic practice that provide additional traction for them in the marketplace. Furthermore, if we consider that economic growth in emerging markets will outpace growth in places like the U.S. and Europe for many years to come, the ability to create products and services that address the needs of consumers beyond the confines of the U.S. market may also suggest that for America to remain competitive in the global marketplace, luring entrepreneurial talent from around the world to address global problems is more important now than ever. Ivan Light provides a thoughtful analysis on the rise of immigrant entrepreneurs in America. We also feature several American Muslims who successfully won seats in local government this year, and we include an interesting story about two Muslims vying for the same political office in Cambridge, Massachusetts. We also profile Abdallah bin Bayyah, one of the few Muslim scholars who is respected by virtually all sects in Islam, which has turned him into a scholar celebrity. Bin Bayyah is often seen as a critical face to American Islam, with almost every prominent American Muslim scholar and leader considering him their teacher. Governments frequently ask him to address questions of extremism and religion. While few Americans know of him, he may very well be the most influential scholar of Islam when it comes to Muslims in America. However, America’s right wing considers him a controversial figure and often criticizes his work. Our magazine is no stranger to interviewing controversial figures, and in our interview with Bin Bayyah, we ask him about how he reacts to religion, violence and about his impression of Muslims living as a minority in America. Also touching upon the theme of America’s changing face is our feature on a young Syrian refugee living in America and an article on America after the Boston bombing written by Yvonne Haddad and Nazir Harb. We also ask three notable experts to weigh in on some of the most challenging, and changing, issues in the U.S. today: gun control, immigration and health care. David Cole addresses President Barack Obama and drones, and Salma Hasan Ali features a prominent Indian artist who is reviving the dying art of embroidery. For the first time ever, this issue also weaves in much of our online multimedia content with our podcasts, audio documentaries and readers’ responses to some of our most highly trafficked online articles. 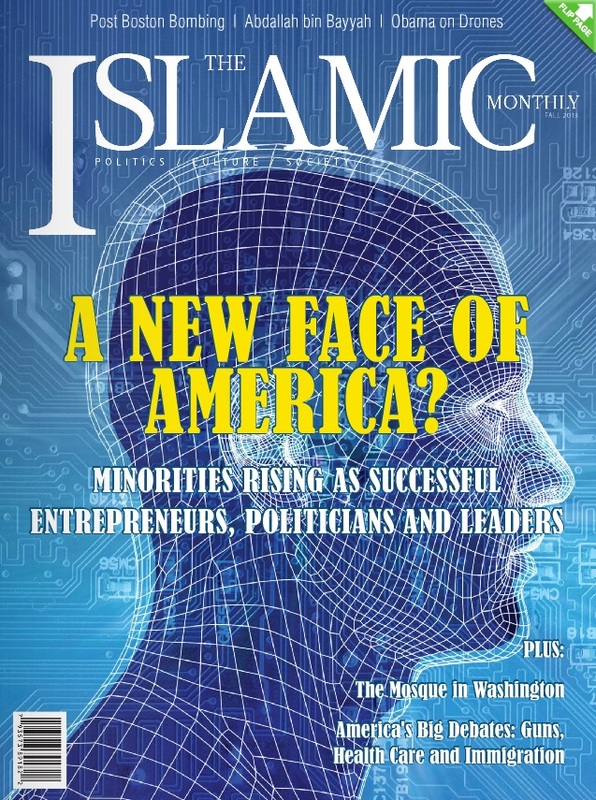 This issue is released at a time when Americans are observing minorities assuming critical roles in society as they also quickly become prominent and successful Americans. The Global Flows of Entrepreneurs and their Innovation: Creative Destruction?